For the constituency of this name, see Cleethorpes (UK Parliament constituency). Cleethorpes is a seaside resort on the estuary of the Humber in North East Lincolnshire, England with a population of nearly 40,000 in 2011. It has been permanently occupied since the 6th century, with fishing as a primary industry, while developing as a resort since the 19th century. The town lies on the Greenwich meridian and its average annual rainfall is amongst the lowest in the British Isles. 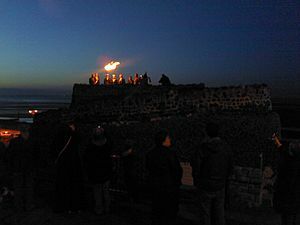 The name Cleethorpes is thought to come from joining the words clee, an old word for clay, and thorpes, an Old English/Old Norse word for villages, and is of comparatively modern origin. Before becoming a unified town, Cleethorpes was made up of three small villages, or "thorpes": Itterby, Oole and Thrunscoe, which were part of a wider parish called Clee (centred on Old Clee). Whilst there are neolithic and Bronze Age remains in the area, permanent occupation appears to date from the 6th century, when the Danes arrived, with substantial communities appearing only in the 9th century. The manor of Itterby was purchased in 1616 by the trustees of Peter Blundell's charity for the benefit of scholars and fellows at Sidney Sussex College, Cambridge from Blundell's School, Tiverton. This is reflected in many of the street and park names in the area. Cleethorpes developed as a fishing village. By the time of the 1801 census the population was 284. The 1820s saw the first developments of Cleethorpes as a health holiday resort, with sea-bathing and the taking of medicinal waters becoming fashionable. By 1831 the population had increased to 497. "...much resorted to as a bathing-place, for which it is highly eligible; the air is pure, the scenery good and besides a few lodging-houses and smaller inns, there is a large hotel, built some years since, on an eminence embracing extensive views of the sea, the Humber, and the Yorkshire coast. Many of the population are employed in the oyster-fisheries." The resort expanded following the linking of the town by railway with the industrial towns of Yorkshire. Cleethorpes Pier opened in 1873 and the promenade in 1885. Cleethorpes with Thrunscoe was constituted a Local Board of Health District in 1873, and under the Local Government Act of 1894 it became an urban district. In 1916 the urban district was renamed Cleethorpes, and in 1922 and 1927 the town's boundaries were extended to include part of Humberston (as far as North Sea Lane) and the Beacon Hill area of Weelsby parish. In 1936 Cleethorpes was granted a charter of incorporation to become a municipal borough. Cleethorpes successfully resisted attempts by Grimsby to absorb it and in 1974 it became the Borough of Cleethorpes within the new county of Humberside. However, when Humberside County Council was abolished in 1996, Cleethorpes Borough Council was joined with Grimsby Borough Council as the unitary authority of North East Lincolnshire. In 2009 North East Lincolnshire Council agreed to market the towns of Grimsby, Immingham and Cleethorpes, under the 'Greater Grimsby' banner. Local residents from Lincolnshire and the Humber area affectionately refer to Cleethorpes as Meggies; the two largest resorts on the Lincolnshire coast are known by their nicknames 'Meggies' (Cleethorpes) and 'Skeggy' (Skegness). Cleethorpes can also be known as "down beach". Cleethorpes has undergone significant redevelopment, with JD's Nightclub and the Lifeboat Hotel both being demolished to build flats overlooking the beach. The Winter Gardens, a venue for a variety of events, was also demolished in 2007. In 2007 a North East Lincolnshire Council's committee accepted proposals for the demolished Cleethorpes Winter Gardens to be replaced by 47 flats. This resulted in some local opposition. Shopping facilities have been augmented with a 2-floor Tesco Extra, expanded in 2007. Cleethorpes is twinned with Königswinter, Germany. The Greenwich meridian passes through the town and a signpost shows some distances in miles. North Pole 2,517 miles (4,051 kilometres), South Pole 9,919 mi (15,963 km), New York City 3,481 mi (5,602 km), London 143 mi (230 km). 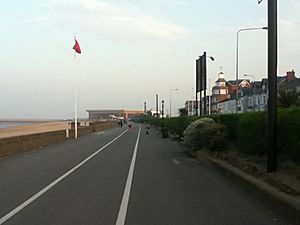 Cleethorpes is a seaside resort and is physically linked to the neighbouring town of Grimsby (the main town boundary running along the residential Park Street). Between the two towns is the (former separate) village of Old Clee and Weelsby. The town consists of three former parishes. The boundary crosses the A180 at Park Street, which is also the DN32/35 postcode boundary. 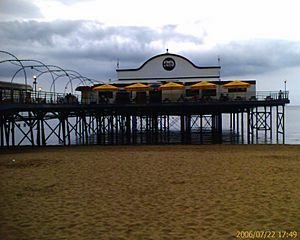 As with most of the British Isles, Cleethorpes experiences a maritime climate. It has mild summers and cool winters. The average annual rainfall is amongst the lowest in the British Isles. Bus services to Grimsby, Immingham and nearby villages are operated by Stagecoach Grimsby-Cleethorpes. There is a bus service to Skegness via Louth, which runs once a day on weekends in the summer, provided by Stagecoach Grimsby-Cleethorpes. 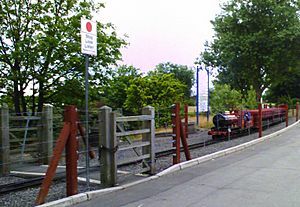 From Cleethorpes railway station, operated by TransPennine Express, train services run, via Grimsby, to Barton-upon-Humber (for bus link to Hull), Manchester Airport (South TransPennine) and Newark-on-Trent. 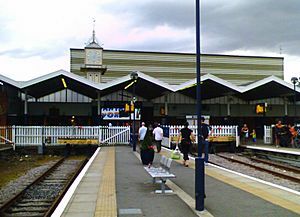 The railway station is also served by Northern and East Midlands Trains. Cleethorpes is at the termini of the A180, A16 and A46 roads. Secondary schools in Cleethorpes include Cleethorpes Academy and Holy Family Catholic Academy. From September 2011, N.E. Lincolnshire SSP was the only remaining School Sports Partnership after government funding cuts. The parish church is St Peter's, built in 1866. 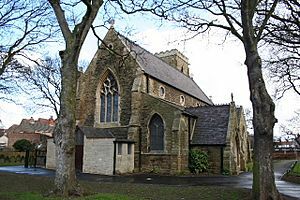 Other churches are St Francis of Assisi on Sandringham Road, and Holy Trinity and St Mary's Church in Old Clee, the oldest building (built 950AD) in Grimsby. Christ Church of Cleethorpe, near Machray Place, is also one of the larger parishes. St Aidan's Church on the A180 Grimsby Road was administered in the 1950s by John Hurt's father. 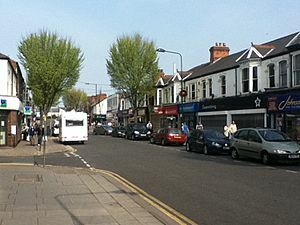 Cleethorpes is home to Blundell Park, the home ground of the football team, Grimsby Town, one of few English League clubs with a town or city name to have their home ground in a different community. There is an athletics club and Cleethorpes Rugby Union Football Club who play in the Midlands 4 East (NE). Cleethorpes cricket ground, known as Cleethorpes Sports Ground, is located on Chichester Road. It hosts professional games such as the 20/20 cup and various county games played by Lincolnshire County Cricket Club, and the Vagabonds cricket team. Cleethorpes Town F.C. play in the NCEL Division One. Their home matches are played at the Bradley Community Stadium. The reserve team play at the Linden Homes Club, Clee Road, Grimsby. While commonly referred to as a seaside resort, Cleethorpes actually sits on the Humber estuary. The sea at Cleethorpes is actually the mouth of the Humber. This means that bathers are separated from the sea by several hundred yards of sand at low tide. The sea front provides views of shipping traffic entering and leaving the Humber for the ports of Grimsby, Immingham, Hull and Goole. The main shopping area is St Peter's Avenue (B1374). There is a Royal National Lifeboat Institution station, which is near the pier and next to the Coastguard on Central Promenade. Plans for a new and larger RNLI station were published in 2014. Cleethorpes Rescue also protect the beach. Cleethorpes has a large boating lake with many varieties of ducks, swans and geese. To the south of the resort near Humberston is a yacht club. The Cleethorpes Leisure Centre was opened in 1983 to eventually replace the bathing pool that was wrecked by storms on 11 January 1978. The leisure centre contains a 33-metre pool, 1.8 metres deep, as well as a water slide and a wave machine. The building also contains a gym and a sports hall. In 2012, major work was carried out to the roof of the building due to water damage. 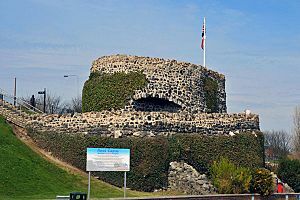 Ross Castle, a mock ruin of a castle built in 1863 by the Manchester, Sheffield and Lincolnshire Railway, was named after Ernest Ross, secretary of the railway company. Its height was the highest point on the cliffs. After a period of closure, the castle was renovated, re-opening in June 2008 to the public. Possibilities of a further closure have been raised after a woman fell to her death on 9 January 2009. In 2007 the town was the Royal Horticultural Societies Britain in Bloom award winner in the coastal category. The town was also received a Silver-Gilt award, a Tourism Award and Jeff Blanchard the Shredded Wheat Community Champions award. A statue of the Boy with the Leaking Boot was given to the town in 1918 by John Carlborn. It is reported that he was a Swedish immigrant to Cleethorpes who had built up a successful shipping business, and that the statue was a copy of one in the Hasselbacken Restaurant in Stockholm, Sweden. The Cleethorpes statue stood in the Pier Gardens but is now in the town hall, with a replica on display in the Tourist Information Office. The statue is now on display on the sea front close to the leisure centre. A nearby public house, the Leaking Boot, was destroyed by fire in June 2009. The Jungle Zoo (formerly Jungle World), criticised by council inspectors and animal protection groups because of welfare concerns. On 22 September 1956 at 3pm a UFO was spotted for more than an hour off the Cleethorpes coast; it was seen by radar at RAF Manby too. It was a large spherical object with a glass appearance. The Lakenheath-Bentwaters incident had happened the month before. Cleethorpes Facts for Kids. Kiddle Encyclopedia.